In 2017, North America fell behind Western Europe to become the second most prosperous region in the world. Prosperity in North America declined faster than in any other region in 2017. This decline was driven by weakening Social Capital, Personal Freedom and Safety and Security. Despite being a region of only two countries, North America is home to 350 million people. Canada fell three ranks in the Index this year to eighth, and now has its lowest prosperity score since 2007. The US fell by one rank to 18th. Despite some falls, North America still ranks first (as a region) in Business Environment, Economic Quality, Social Capital and Education. It ranks second in all other pillars. There has been an improvement in Governance and small improvements in both Business Environment and Economic Quality. The US has the best Business Environment in the world; and in 2017 it improved due to better intellectual property protection. Canada is fourth best, but it slipped in its Business Environment ranking, as people felt financial services had become less affordable and thought that hard work was less likely to get them ahead. Although confidence in elections among US citizens has dropped considerably, Americans’ faith in governance increased, as citizens felt that the judiciary were more independent of government, and felt that the legal system could more easily challenge regulation. Businesses also felt that government policymaking had grown more transparent. Despite the fall in Personal Freedom, Canada still ranks second for this pillar – in contrast to the US, which ranks 28th. This is in part due to its high social tolerance: Canada ranks second in the world for societal tolerance of other ethnicities and immigrants. As stated above, Social Capital is declining in both the US and Canada – in both countries people are donating and volunteering less frequently. Unlike in Canada, the US particularly saw worsening Safety and Security, due to the increase in homicides and terrorist attacks. Canada has also struggled considerably in the last decade in Health and fell considerably in this pillar in 2017. A nationwide fall in vaccination rates has caused a growing incidence of preventable illness; Canadians also reported many more health problems in general. The US has also seen a decline in the health pillar over the decade. The US and Canada have fallen nine and ten rankings, respectively, in Health as a result. Canada improved its score in Natural Environment through increased protection of land. Since 2007, both Canada and the US have improved significantly, with the greatest contribution coming through improved air quality. 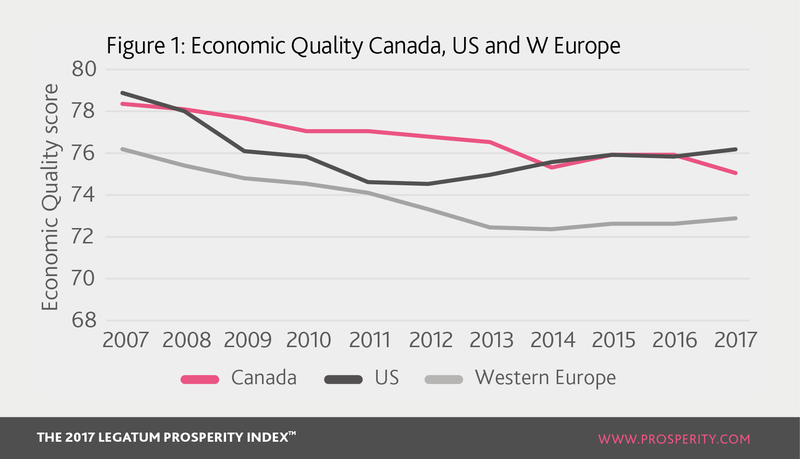 Overall prosperity in North America has been faltering for the past decade; and declined further in 2017. Having been the world-leading region for ten years, North America’s prosperity score fell more than any other region and now trails that of Western Europe. In the US, people report that they have less freedom to make life choices than before and are experiencing much greater societal pressure on their religious freedom. North America’s shrinking Social Capital is perhaps one cause – in this pillar both Canada and the US fell dramatically this year. Civic engagement has declined in both countries: people are less likely to donate money to charity than last year and they volunteer less frequently – two measures in which North Americans had previously led the rest of the world. But Canada also fell in the area of personal and social relationships: people are now less open to offering informal financial help and fewer Canadians say that they have relatives or friends they can count on in times of need. Social Capital in North America has not been the only pillar to fall this year; Personal Freedom has also weakened. In the US, people report that they have less freedom to make life choices than before and are experiencing much greater societal pressure on their religious freedom. The coincidence between these two pillars suggests at least some degree of causation: as citizens become concerned about their choices being increasingly limited – including in their freedom of religion — levels of trust are eroded. This then dents confidence in the market and in the give-and-take of all exchanges. Civic engagement is thus reduced, which in turn contributes to a more atomised society. The danger is that Social Capital may be weakening just as it becomes more, rather than less, important in our increasingly digital age. What lies behind this growing social poverty? It is clearly a challenge to address the problem on a national level without considering variation between states/provinces: these two nations have a widely diverse population, geographically and culturally. Yet this year the Index data offer some clues as to where the stress might originate. 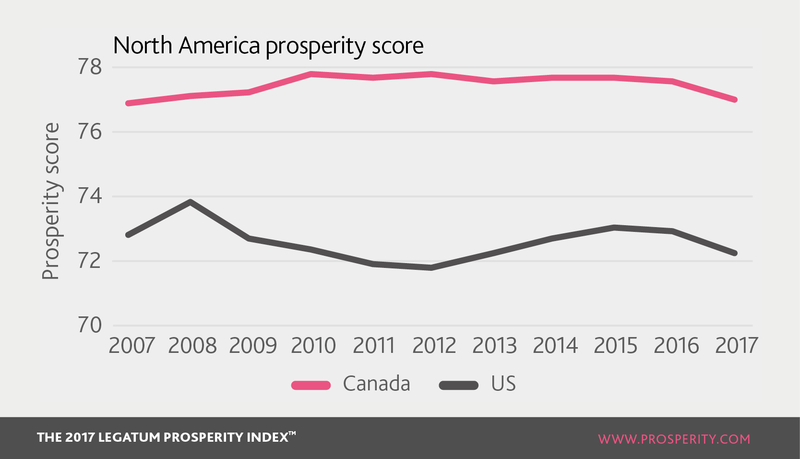 Data from the Prosperity Index show the US and Canada embarking on two quite different trajectories since the financial crash of 2008 (Figure 1). The US initially had a steep fall in Economic Quality, driven by rapidly growing unemployment and dissatisfaction with both standard of living and household income. Government was perceived to be doing much less to encourage competition and failing to deal with barriers to trade, while participation of the labour force dropped. Then, after a low in 2012, the US saw a resurgence in almost all of these measures and has since regained almost half of the ground it had lost. 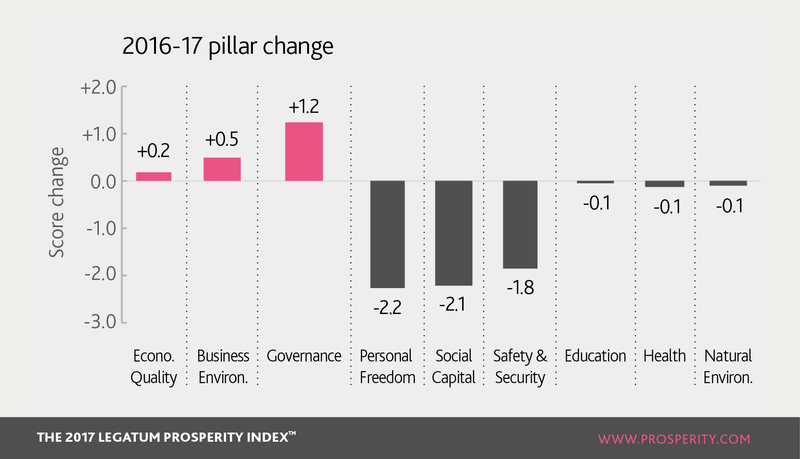 Data from the Prosperity Index show the US and Canada embarking on two quite different trajectories since the financial crash of 2008. Canada instead appeared to be weathering the economic storm more successfully. Having scored less than the US for the quality of its economy in 2007, by 2012 it enjoyed a clear lead over its neighbour. While Canada also suffered from trade barriers and scarce encouragement of competition, it did not suffer the same levels of unemployment, and people were actually happier with their standard of living in 2012 than they had been in 2007. But since 2012, Canada’s Economic Quality has declined, despite a marginal increase in growth and in satisfaction with household incomes. Whereas in the US, government is seen to be encouraging competition more than in 2012, the reverse is now true in Canada. In fact, Canadians now feel that the government is doing less to counter monopolies; as a result, for the first time in ten years, the US has regained its advantage in Economic Quality over Canada. In prosperity terms, Canada has suffered more than economically in the last few years. Whereas the US extended its lead as the best place in the world for business, Canada saw its Business Environment worsen because its citizens regard financial services as increasingly unaffordable. The nation’s entrepreneurial environment suffered too, as people feel less convinced that working hard will get them ahead. The US has improved economically since 2012 – as captured by our Index data – but this progress has not resulted in an increase in optimism among citizens: North Americans today are less likely than ten years ago to believe that hard work will get them ahead in life. Middle-class wage stagnation has long been regarded as the central challenge facing America’s economy: while productivity is increasing, working Americans have received no subsequent gains in income. Instead of being a reward for greater output, the perception is that extra revenue is instead being channelled into the pockets of the wealthy: this has fuelled a widespread belief that capitalism in America is a broken model that rewards the elite rather than the hard-working many. A study from the Economic Policy Institute suggests that whereas increased productivity had a meaningful effect on wages in the mid-20th century, since 1970 productivity and wages have become relatively decoupled from one another. Some American economists and commentators have challenged this view, arguing that the real issue is not a broken economy, but a lack of productivity growth. Data from the Census Bureau show that the median wage in the US actually rose by 5.2% in 2015, and then again by 3.2% in 2016. The nation’s poverty rate fell in both of those years. Productivity, however, has grown at a historically low level of 1.1% in the same time period – had it increased by mid-20th century rates, median incomes would be $40,000 higher than they are today. Whether productivity can ever be measured properly remains a puzzle; what is unquestionable, however, is that economic inequality persists and is growing in the US. The US will struggle to prosper more fully until it meets this challenge.